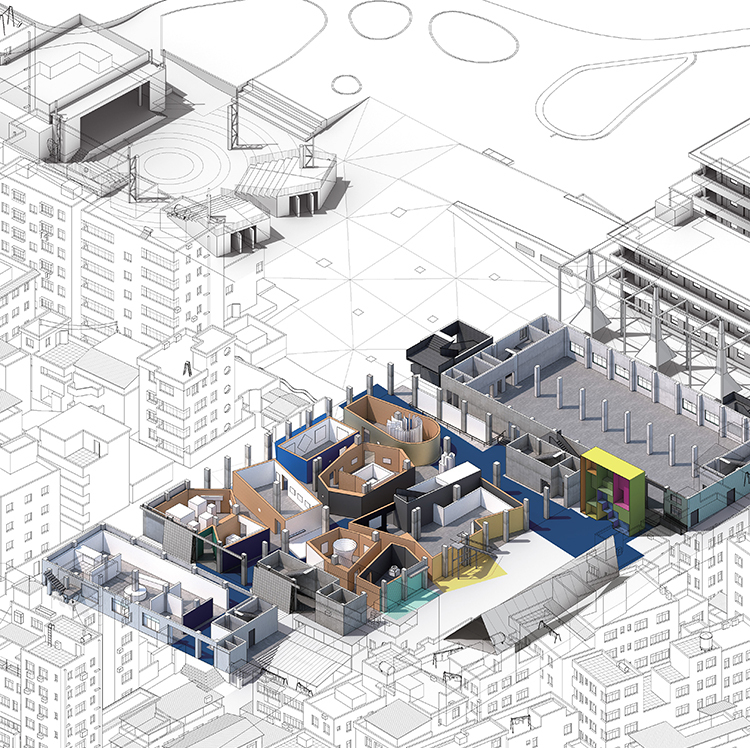 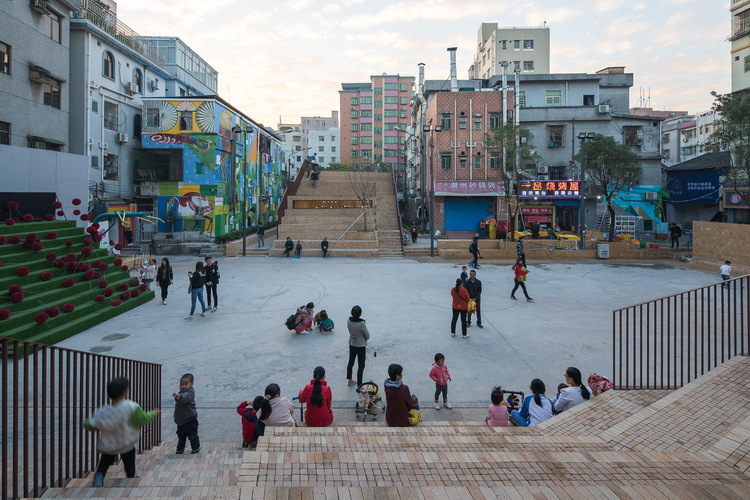 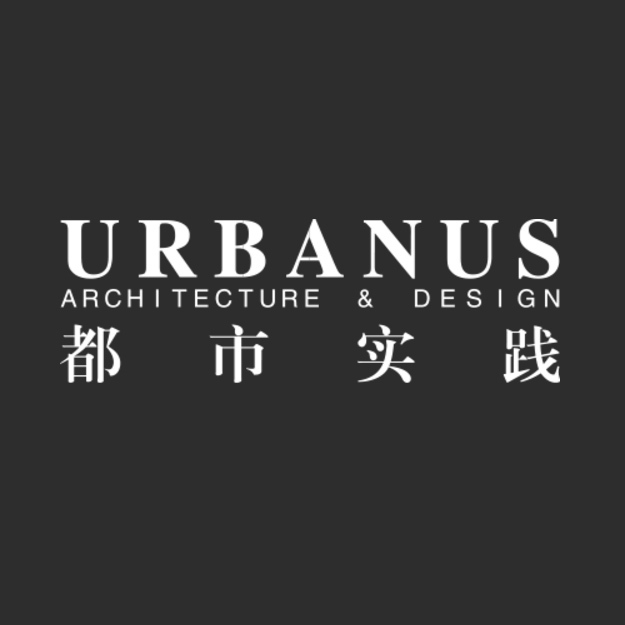 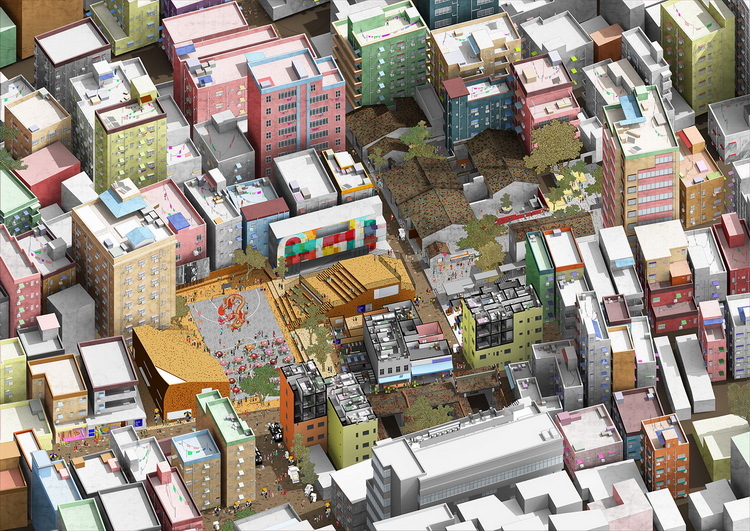 Based on the preliminary study on Nantou, Urbanus proposed a development model of introducing cultural events, preservation, intervention and regeneration. 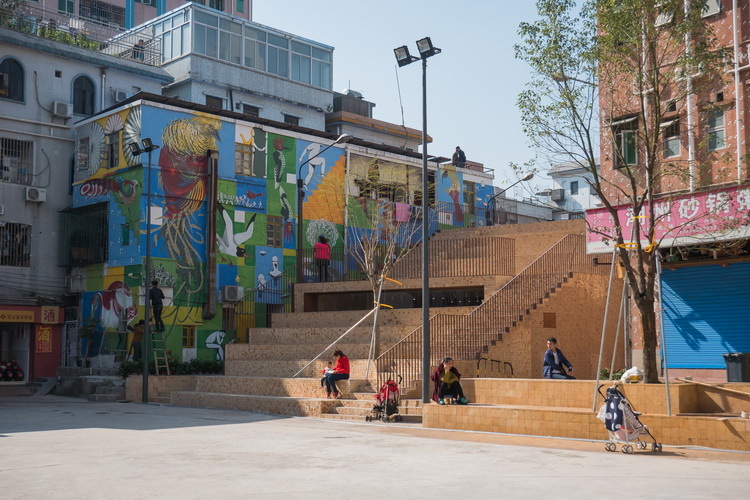 Adapted to local conditions, we drafted six tailor-made regeneration plans which can be implemented at a later time: Parks and Gardens Revival Plan, City Boundary Redefinition Plan, Historical Building Preservation Plan, Main Street Navigation Plan, Creative Factory Plan and Inner City Dynamic Regeneration Plan. 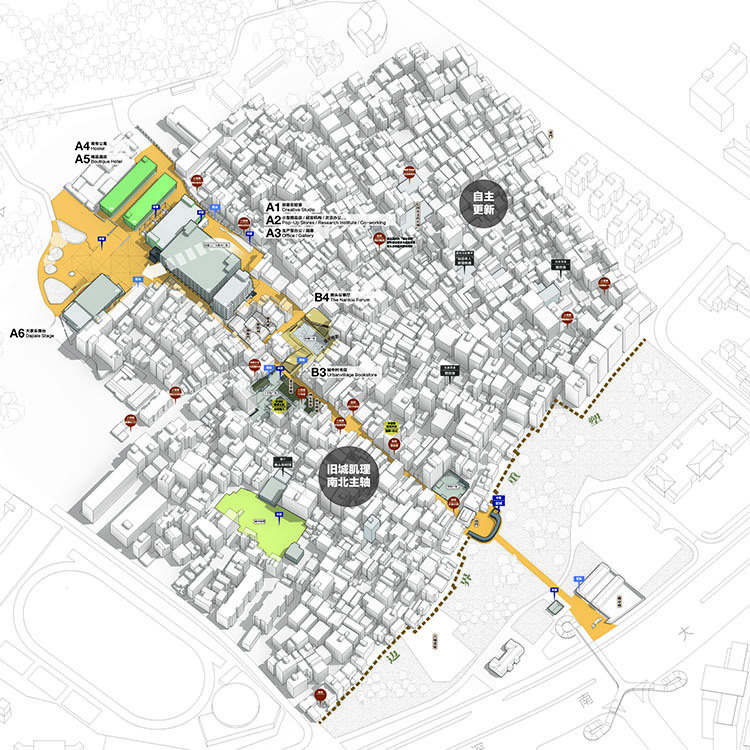 These projects mainly focus on the renovation of key public spaces and the introduction of public activities as part of the process of activating and promoting the regeneration of the Old Town. 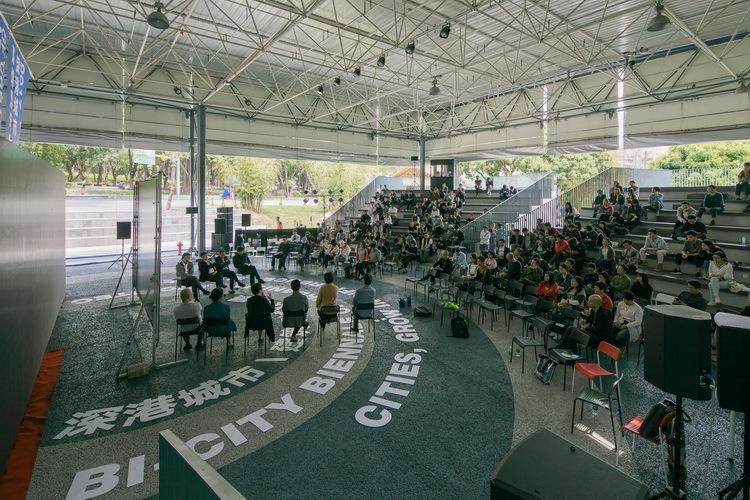 Later on, after sufficient field investigation, urban design and research work, we came up with the idea to propose Nantou as the main venue of 2017 UABB in the biennale venue selection process. 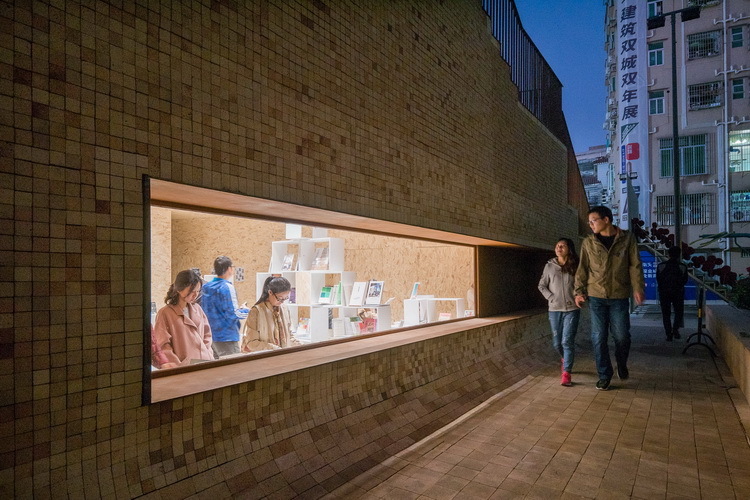 After consensus was made on the venue, further field surveys and research into Nantou’s history helped us to find a narrative line on which spatial renovation and the exhibition implementation could highly coincide. 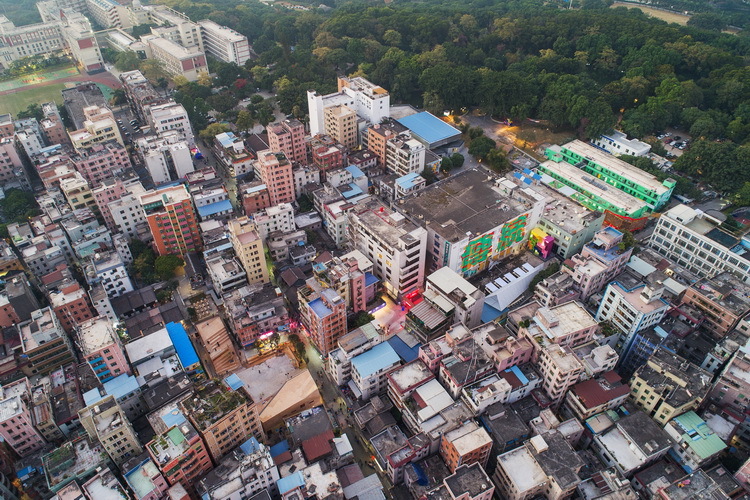 A series of renovations along with this narrative line will, with most effective interventions, have minimum interference with the daily life of local residents. 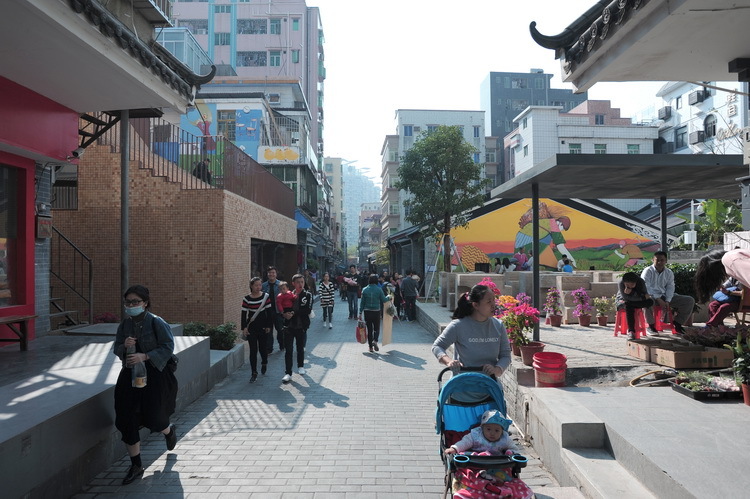 They will improve the public space quality of the Old Town to a maximum effect, while leaving enough room for future development. 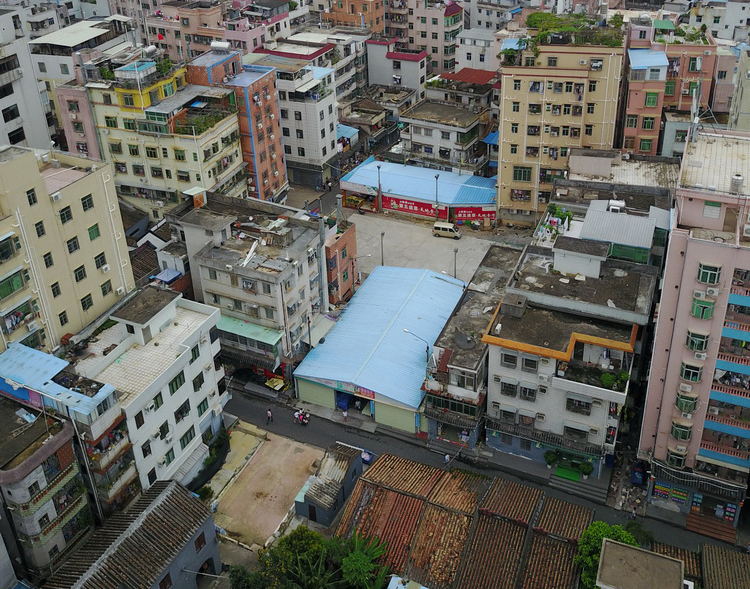 The Nantou Old Town is located to the north of Shennan Avenue and south of Zhongshan Park. 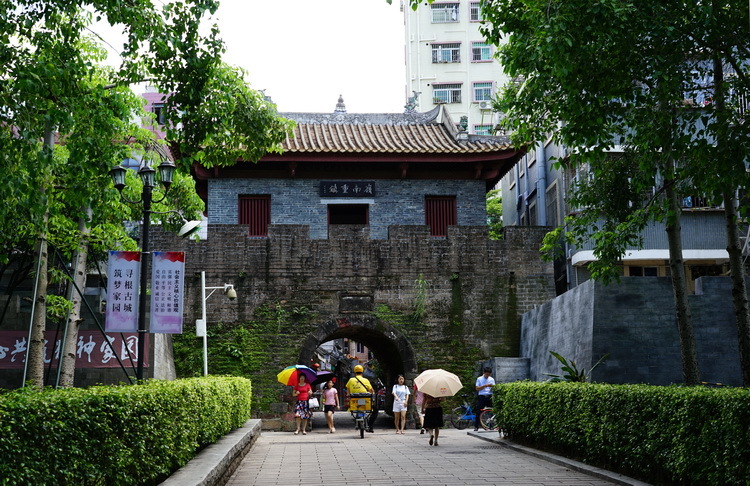 Built along a gentle slope, the Old Town used to be guarded by four gates in four directions. 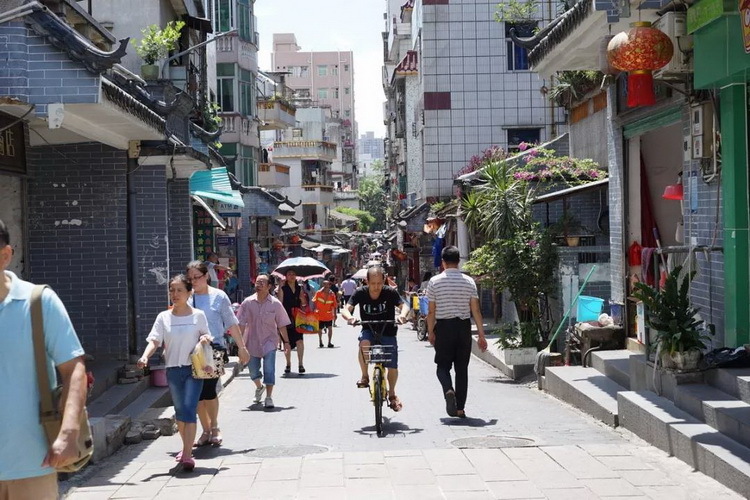 The northern gate was abandoned in the middle of the Qing Dynasty, and the northern street in the traditional county town’s “Cross Roads” pattern lost its vitality ever since. 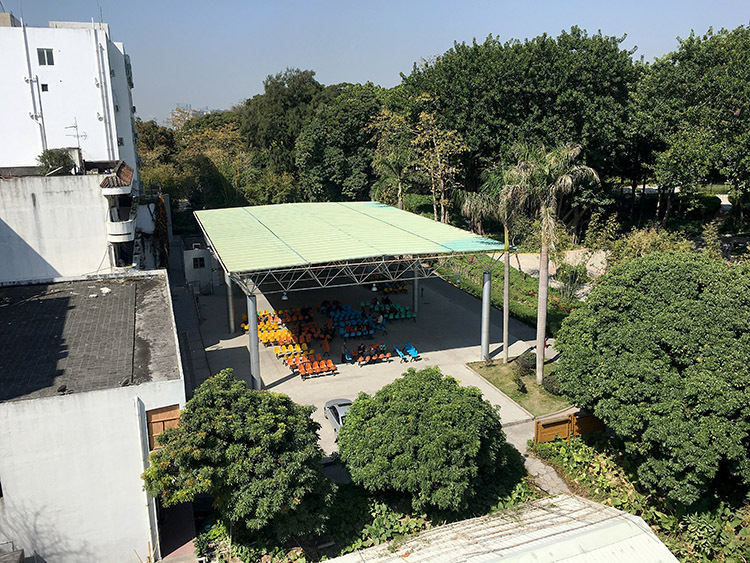 Zhongshan Park to the north of the Old Town was the earliest public park in Shenzhen. 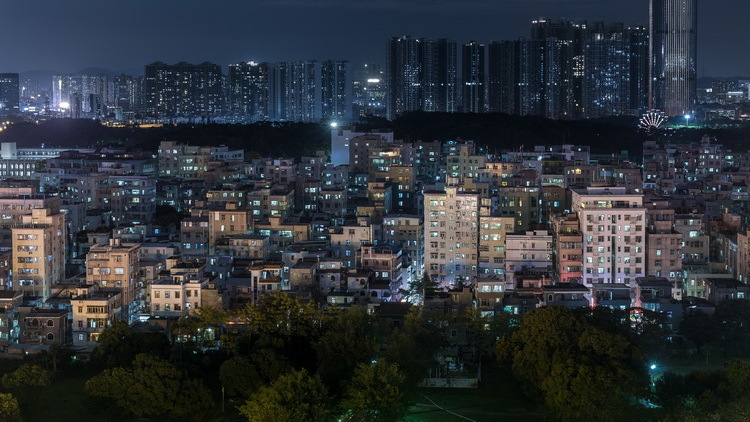 It was built during the Republican era of China and features old, towering trees that attract many visitors. 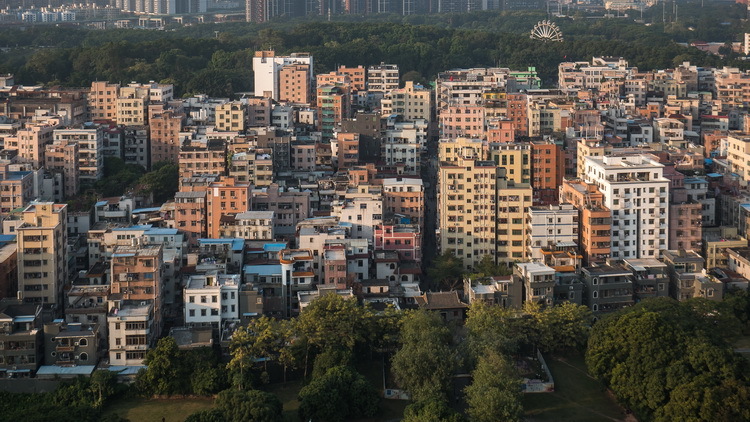 The wall surrounding the factory area constructed in the 1980s separated the park from the Old Town. 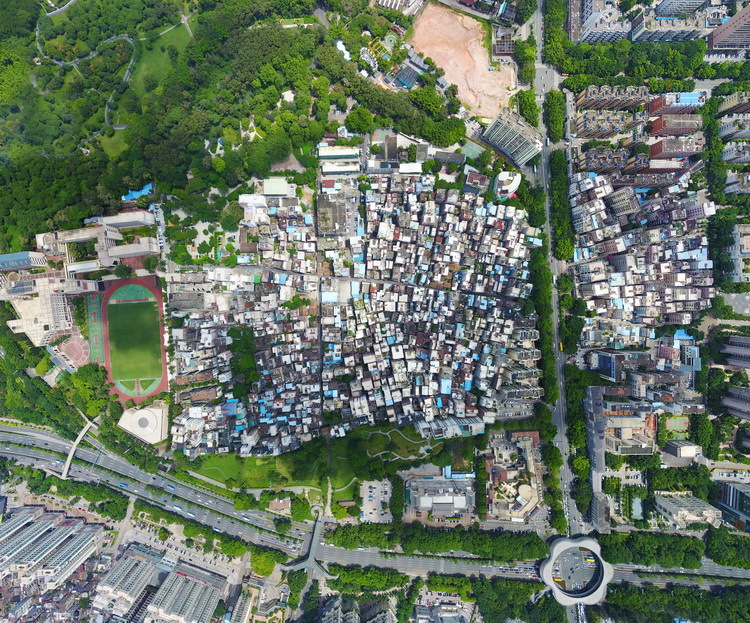 We decided to reconfigure this critical node by extending South Zhongshan Street northward, restoring the traditional “Cross Roads” pattern and reconnecting Zhongshan Park, the Old Town and the Park outside the south gate. 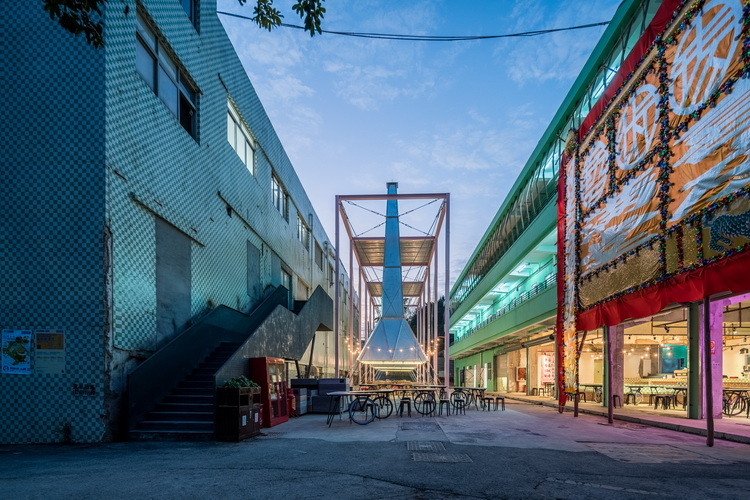 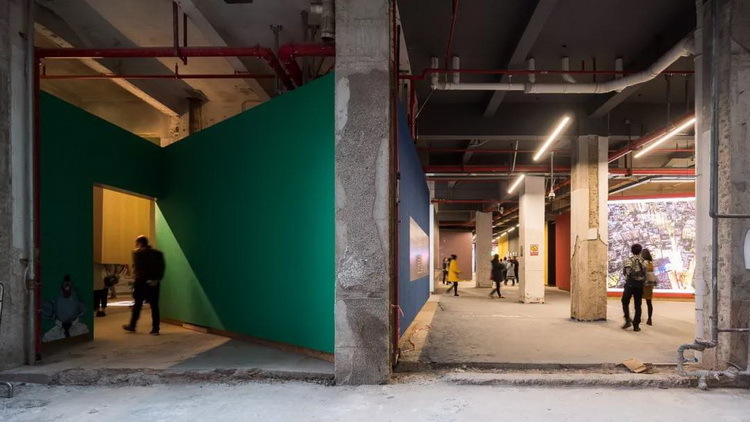 This step of spatial restructuring will be the starting point of future old town regeneration, beginning with a series of exhibition venues for the UABB, which will be rolled out along this main spine. 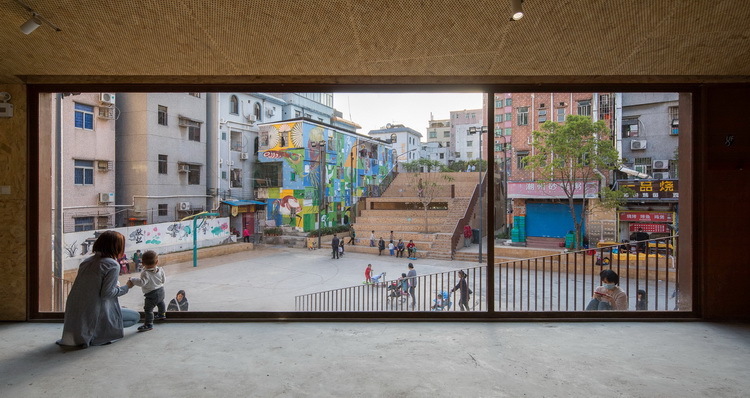 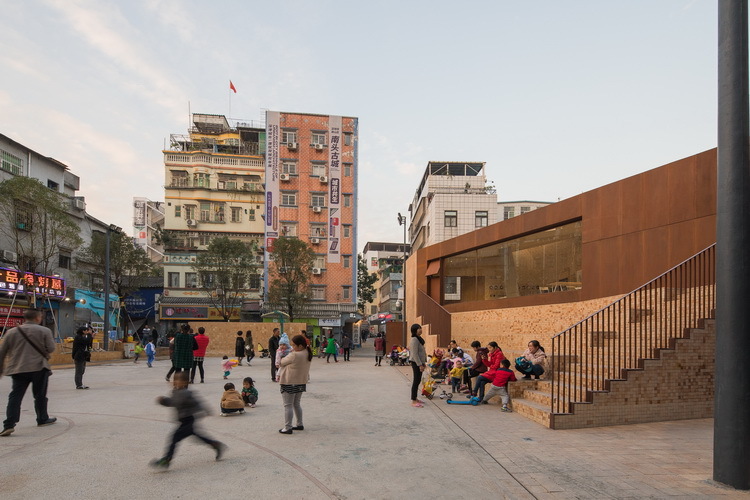 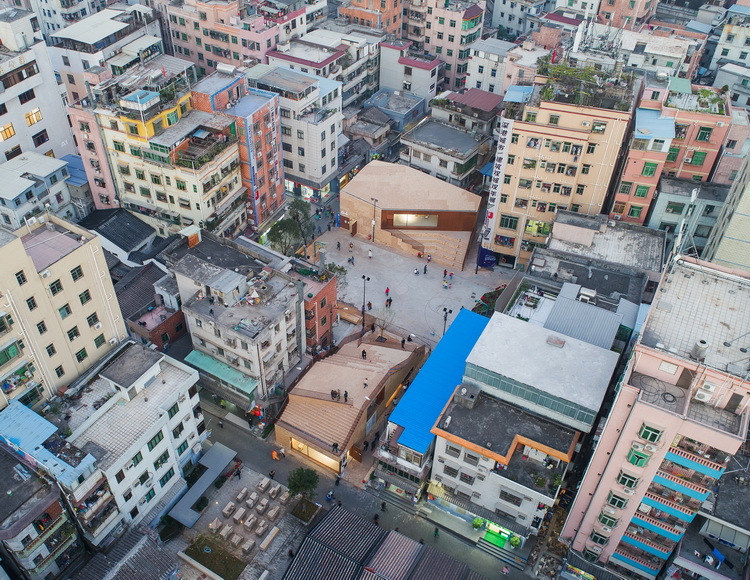 Following the urban design strategy of preservation and regeneration while locating exhibition spaces for UABB, we sought to reconstruct a public open space system in Nantou. 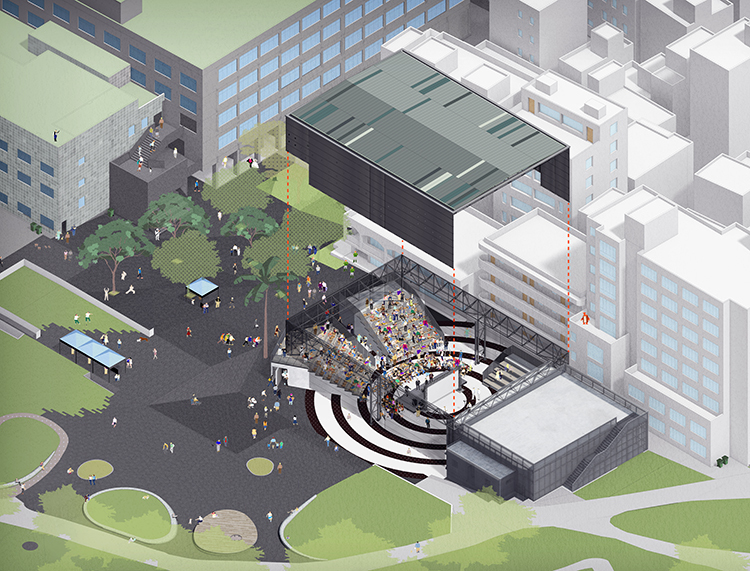 Serving as an exhibition route, this system consists of both architectural spaces and outdoor venues. 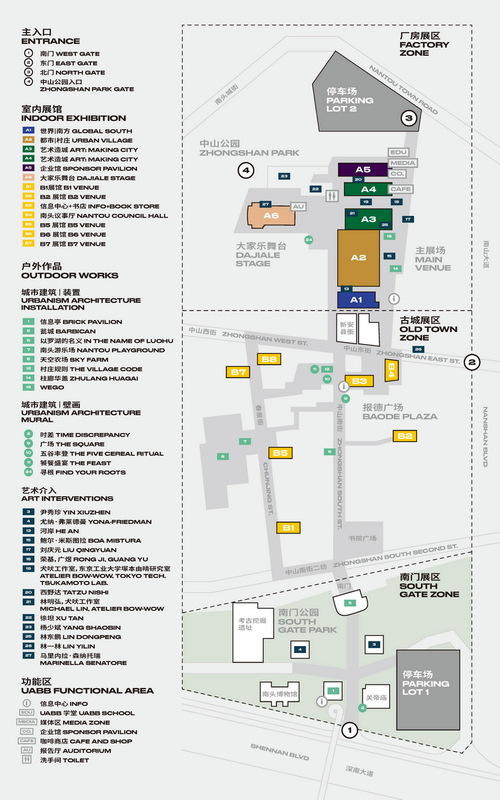 The exhibition venues are in five zones from north to south and extending out toward east and west: A. 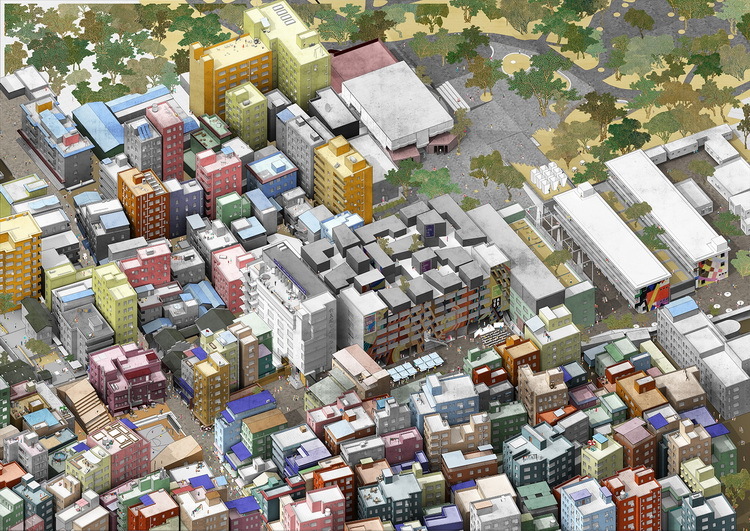 Factory Zone, B. 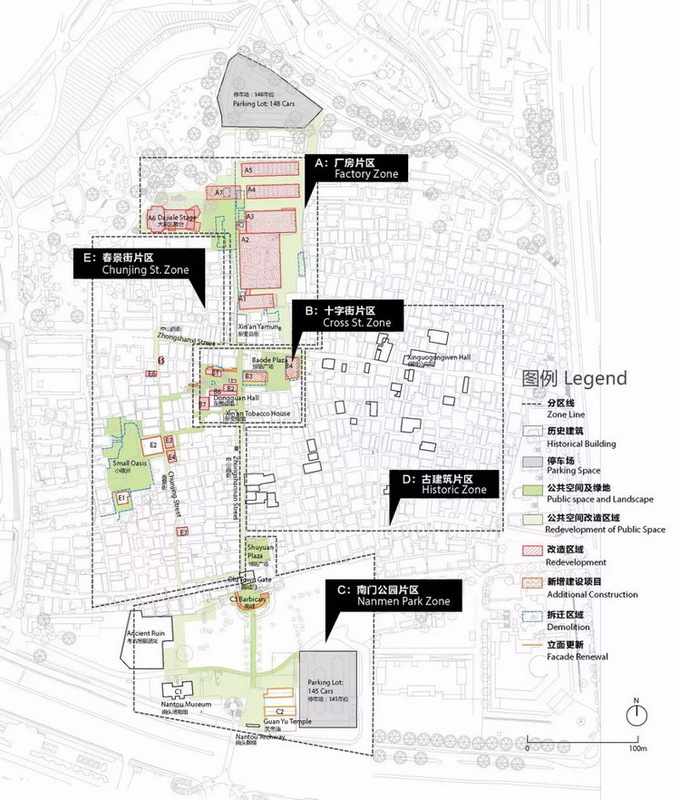 Cross Road Zone, C. Southern Gate Zone, D. Historic Buildings Zone, and Chunjing Street Zone. 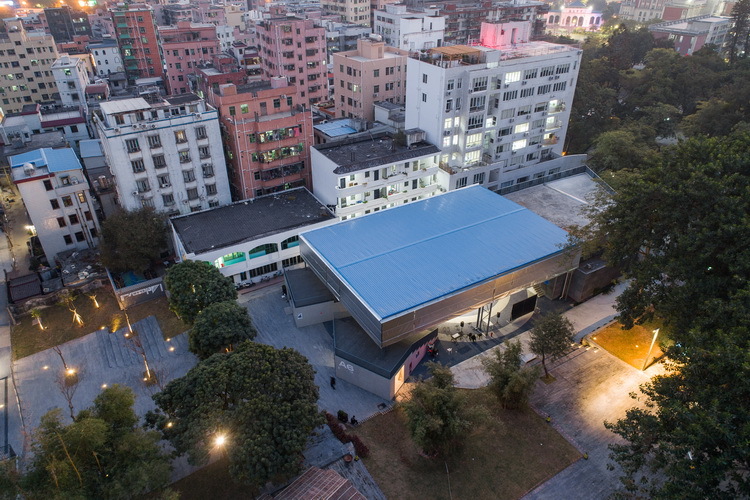 The whole exhibition spatial narrative is formed with the following seven interlocking themes, like the structure of Chinese literature or drama. 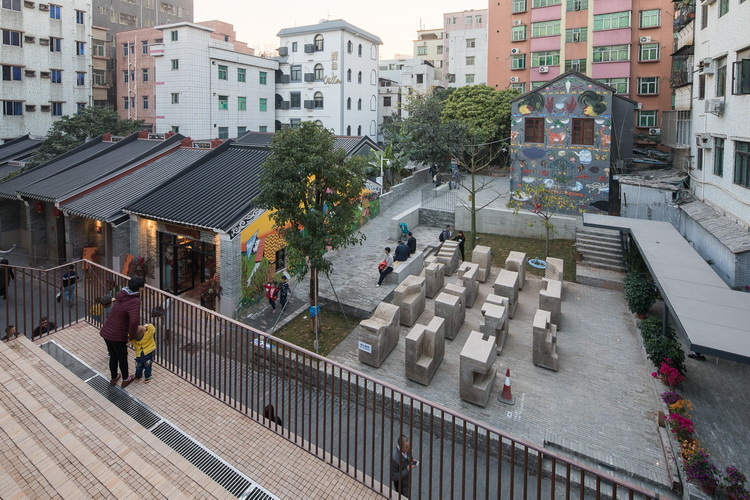 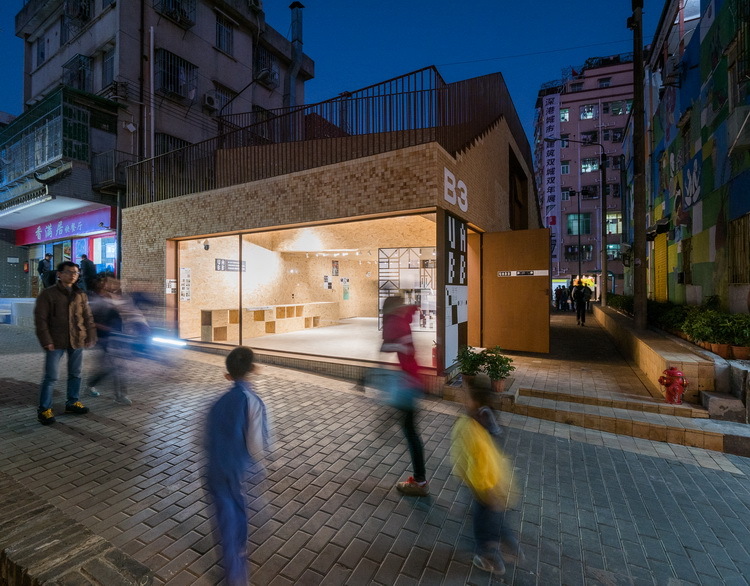 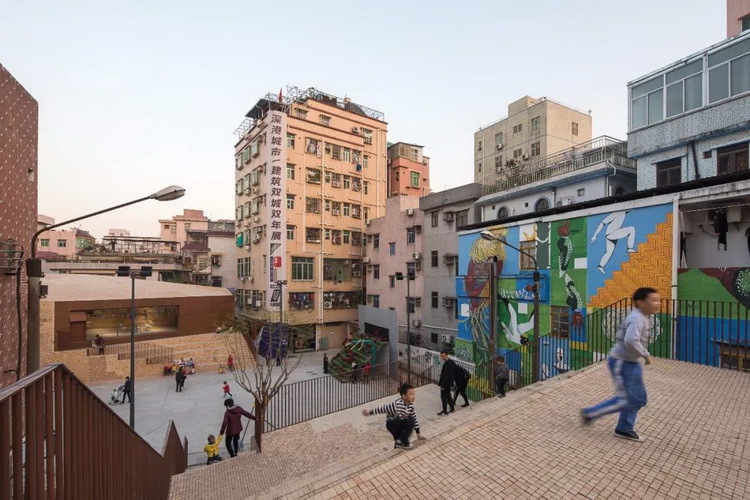 The urban intervention of this UABB is highly consistent with the old town regeneration plan, through renovation for exhibition spaces, architecture and art interventions, and organized events to bring an alternative experimental opportunity for the regeneration of Nantou Old Town and the renovation of urban villages in general. 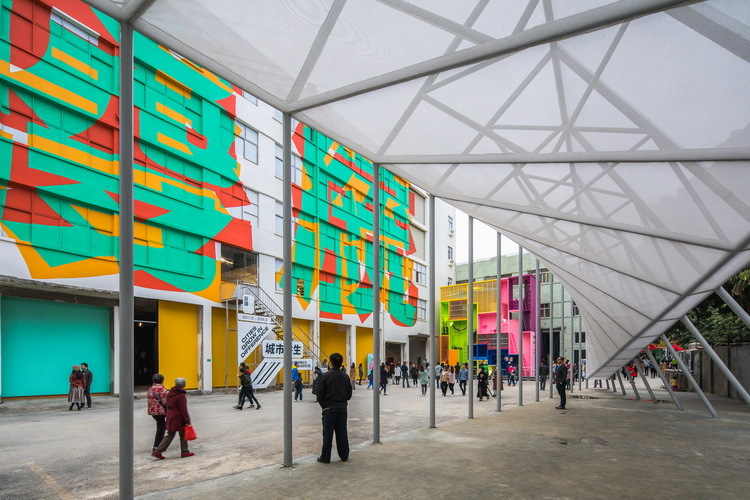 “Urban curation”, in contrast to the current urban renewal process, is a long-term strategy for the incremental improvement of urban spaces and the quality of urban life.